Some people in Seoul on Tuesday said they are happy just to see U.S. President Donald Trump and North Korean leader Kim Jong Un talking to each other rather than trading threats of war. “I am very happy because it is an epoch breakthrough after 70 years of division,” said Lee Jun-keun, a salesman working for a retail business. Last year the two leaders traded insults, with Trump calling Kim “rocket man,” and the North Korean leader calling the U.S. president a “dotard,” and they both threatened military action as tension rose over the North’s accelerated weapons testing to develop an operational nuclear armed intercontinental ballistic missile capability. 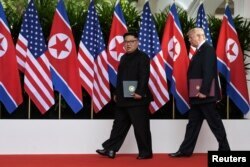 U.S. President Donald Trump and North Korea's leader Kim Jong Un walk during their summit at the Capella Hotel on Sentosa island in Singapore, June 12, 2018. But after North Korea successfully test-fired missiles it claimed could carry nuclear warheads capable of reaching the United States, Pyongyang pivoted to diplomacy by suspending further provocations and indicating a willingness to engage in denuclearization talks. Trump surprised allies and adversaries alike by immediately agreeing to meet with Kim, long before the specifics of a nuclear deal could be negotiated. Tuesday’s first meeting between a sitting U.S. president and a North Korean leader produced a broad declaration to rid the Korean Peninsula of nuclear weapons and develop a peace treaty to end the long standing hostiles between the U.S. and North Korea. Trump called the agreement “very comprehensive,” but it will be left to negotiators to later resolve differences between Washington’s call for complete and verifiable nuclear dismantlement before any sanctions relief is provided, and Pyongyang’s demand that concessions be linked to incremental progress. Some in South Korea remain skeptical that the broad commitment reached at the U.S.-North Korean summit in Singapore will lead to North Korea giving up its nuclear weapons program. “North Korea did not keep its promise in the past, even after signing the agreement. This is what I am disappointed and doubtful about,” said Shim Jae-yeon, a housewife who lives in Seoul. Others however offered praise for President Trump for keeping the diplomatic momentum moving forward, despite the lack of details in the agreement. “I think he is the president who can pull out an agreement all at once, unlike the others in the past,” said Jung So-young, a nurse who lives in Seoul. 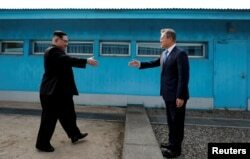 FILE - South Korean President Moon Jae-in and North Korean leader Kim Jong Un, left, are about to shake hands on their first meeting at the truce village of Panmunjom inside the demilitarized zone separating the two Koreas, South Korea, April 27, 2018. Moon helped facilitate the improved diplomatic climate this year by inviting North Korea to participate in the recent Olympics, getting Kim to commit to denuclearization during their meeting in April, and mediating the disagreements that arose between Washington and Pyongyang prior to the summit. Trump temporarily canceled the summit after a Pyongyang official insulted Vice President Mike Pence for his uncompromising demand that North Korea follow the Libya denuclearization model to unilaterally disarm before sanction relief. Before the Singapore summit, the South Korean leader also cautioned that the process to end the North Korean nuclear threat may take two years or longer. A spokesman for the conservative opposition Liberty Korea Party called on the United States, to accept nothing less than the complete, verifiable, and irreversible dismantlement (CVID) of the North’s nuclear program. Trump said progress will happen quickly to wind down the North’s nuclear program that is estimated to include 20 to 60 nuclear warheads, both known and covert nuclear research and processing sites, and thousands of ballistic missiles that can be launched from mobile vehicles, as well as submarine based launchers that have been tested in recent years. At the beginning of the summit, Kim said “the past worked as shackles on our limbs” when speaking to Trump about the difficulty of overcoming the longstanding animosity and confrontation between the United States and North Korea. The Kim government, for its part, wants an end to U.S.-led sanctions that in the last year have blocked 90 percent of trade, agreement on a peace treaty to replace the armistice that has been in place since the end of the Korean War in 1953, a reduction or withdrawal of the 28,000 U.S. military troops in Korea and a prohibition over U.S. nuclear capable ships and aircraft. Trump said after the summit that he will halt further joint military drills, and if the North ends its nuclear program he would consider bringing home U.S. troops in Korea.